Popular from coast to coast. While the Cuba Libre remains the top Rum cocktail by volume in the USA, the Mojito has become to go-to Rum cocktail in upscale bars, restaurants, and clubs. 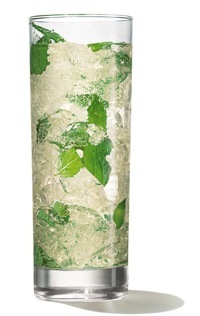 Perhaps it’s the attractive presentation of Rum, lime, and mint artistically layered in a tall ice filled glass. More likely it’s the refreshing aromatics and flavors that act as the ideal off-dry aperitif. If you love Mojitos, and many do, you owe it to yourself to make this cocktail at your bar or at home where you can control and adjust the amount of lime, sugar, and even Rum to best suit your taste. Muddle mint leaves, superfine sugar, two lime wedges, and the juice of the third lime wedge in a chilled rocks or bucket glass. Add ice to fill and then 2 oz light Rum. Top with a couple of splashes of club soda. Garnish with a fresh mint sprig.